Listening to Mr. Hakainde Hichilema’s attempts to eulogise the memory of late President Levy Patrick Mwanawasa on Prime TV’S Oxygen of Democracy was shocking and ridiculously pathetic. At the risk of sounding like a broken record, Hichilema went all the way to whine and groan about what he considers to be our failures as the Patriotic Front. At this point we can tell his vibe line by line even before he opens his mouth because he has nothing new to say except that bitter script he has mastered over the years. Mr. Hichilema despised and abused President Mwanawasa while he was alive. How then can he today sing the praises of the same person after his death? This just goes to show the extent to which the Opportunistic Hichilema will go to try and salvage his relevance as he sinks in the mire of oblivion. Mr. Hakainde Hichilema is where desperation and opportunism meet. Zambia has no space for cold characters with a seared conscience; chancing scavengers with no scruples. When did Hichilema ever say anything good about Mwanawasa while he was alive? Did the departed President ever hear anything good said about him by Hichilema? As part of his overall theme of non-partisan politics, Mwanawasa recalled an incident in which he first met Mr Hakainde Hichilema at State house before he became president of the United Party for National Development (UPND). He was brought to him by Mr Costain Chilala, the prominent Mkushi farmer. This was sometime in February, 2006, the year in which Anderson Mazoka died. Hakainde, as a member of the business community, had a specific business issue to raise with Mwanawasa. Hakainde said, ‘When I decide to join politics, I will come and join you in MMD because I am quite happy with the way you are leading this nation.’ He said this over lunch at Nkwazi House. Two months later, Mr Mazoka died. There was talk that Hakainde Hichilema was being considered to take over from Mazoka. Initially, he was refusing, then he eventually agreed. He didn’t even have the audacity to come and explain himself to me. He didn’t have to, but I don’t know why he gave me the assurance that if the time came for him to join politics, he would rather be with me. I regret the fact that we are opponents. I have a lot of respect for that young man. He could have played a very pivotal role in the governance of this country. But he has to be trained. I would have been happy to provide counsel so that he is moulded into a true leader. His understanding of politics is that it doesn’t matter; you can cheat, provided you get your goals. The problem Mr Hichilema is having now is the fact that he wants to cheat, to mislead, to show that he is what he is not. When some people alleged that he could not assume the UPND leadership because he was a newcomer, he said it was not true because he was one of the pioneers of UPND, that he started UPND with Mazoka and other people…But when he came to me with Chilala to Nkwazi House, he said people were saying he was UPND. So those rumours that I tried to court him as my successor were not true because I was meeting him for the very first time. I didn’t know him before. Of course, I was impressed talking to him. I made enquiries about what he had been and I was impressed that I needed such young people to work with. But I accepted that he was in business and didn’t want to come into politics. That’s why I never even thought of enticing him. But the moment he decided to succeed Mazoka, if at that stage he had come to me to say. ‘I no longer want to remain just a businessman, I want to go into politics’, I would have received him. Not that I would have made him my successor but I would have received him. If he wanted to succeed me, he could have competed with everybody else. And in my view, he is wasting his talent in opposition politics. It’s too late for him to join me. I am going out in the next three years and I don’t want to decide which people the party should work with at the top level. It will be up to the incoming to lead us to consider that position. Hichilema and his shrinking supporters called the late President all sorts of names and refused to work with him when he was alive. He abused the late President Mwanawasa when he was alive by constantly attacking his performance and personality. There is nothing good a bitter man who grouches for a living can say about anybody except when they are departed and he will only do so for his own political aggrandizement. There is also nothing good Hichilema can say about the PF-driven development even when he drives on it and Zambians across the nation benefit from the massive development across all sectors. He arrogantly believes he is wiser than the collective wisdom of the Zambian people. The late President Mwanawasa was a discerning man and he candidly called out Hichilema’s selfishness and opportunism. President Mwanawasa regretted that Hichilema held so much promise but was not truthful and he felt that he missed a great opportunity to work with him. Why then should Hichilema seek to work with the legacy of a man he despised while he was alive? The legacy and memory of the third President of the Republic of Zambia Levy Patrick Mwanawasa must be honoured and respected. Scavenging opportunists must keep away. They sully everything they touch; even sacred things. While he calls PF, since the days of the Michael Sata Presidency to date as Chimbwi-no-plan, truth be said, Mr. Hichilema was a cheat ten years ago he is a cheat today and will continue to be cheat tomorrow. I was going to read this Artical but then, the authour is Sunday Chanda! I am PF but honestly this Sunday Chanda guy is a waste of space. His responses are unfortunately very confrontational. Does this guy really thinks zambians are dull? It was Sata who called Levy all sorts of names including saying some of mwanawasa’s brains were picked up from the tarmac. Agree, Sunday Chanda and his name is now considered rotten rat in TRASH bin. God space his wasted soul, if he died this week that would be the second worst funeral of the year! God forbid, please Sunday don’t hang yourself for not being awarded with a PF ambassador to South Sudan. Sunday Chanda truly has sh1t for brains. Why does the PF hate HH so much? Is this their raison d’etre? Mwanawasa’s analysis of the situation at-that-particular-time was measured, and all embracing. Thoughtful, yet not malicious. He was thinking about the country, and noted HH was a talented man that could have contributed positively to the development of our country. Fast forward to present day, HH has shot himself in one foot. Lungu has shot him in the other. The danger Zambia is facing right now is its incompetent and corrupt leadership, not HH. HH is now simply an old sad clown. Lungu is a corrupt lazy thief. Mr. Hichilema was a cheat ten years ago he is a cheat today and will continue to be cheat tomorrow. Kiiiiikikikikiki, u are so right…it has then become political and senseless, he should have used someone else to talk about it. All those that are referring to MCS, does it mean that if Sata MHSRIP did a Mukuni in his pants even HH should do the same? Just because Sata did something does not make right for other opposition leaders to do it. You are just agreeing that HH has no persona. He works hard to be Sata’s copycat instead of building his style of politics. Just read the book from which Chanda has quoted.Demeaning Chanda when all he is doing is to remind HH that you cannot abuse a person when they are alive and start praising them when they are dead.This type of opportunism is next to being devilish. That’s exactly the point. What surprises me is that someone went to dig for that information so that they could use it to demean HH. Did Chanda read what he was putting in the article or not? From what I can see, Mwanawasa regarded HH in high esteem. 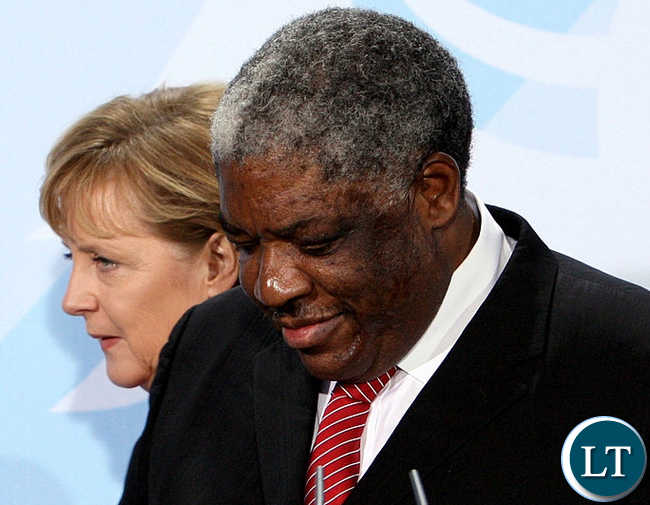 Equally HH showed a of lot admiration for Mwanawasa. You see HH has never been involved in politics of insults. The person who was insulting Mwanawasa on a daily basis was Micheal Sata. HH’s criticism has always been positive and factual without insults. Very typical of a political vulture … I stopped worrying about HH taking over as leader of the smart people of the Zambian Enterprise the moment his chose a harlot for Chilanga and when that did not work, he turned to choose a Pastor as mayoral candidate for the City of Lusaka. Morally ethical people don’t go from one extreme to another in terms of character assessment in a four week space of time. It shows HH can try anything, do anything and use anything to try and win. That kind of wanting to win at all costs is a dangerous trait and show serious character flaws. There is a lot of winning in losing sometimes and HH has no capacity to lead this nation … don’t ever sleep over him, he will never be President of the Zambian Enterprise. Why does PF government have an obsession with one man. Do they fear him that much. HH is a Zambian citizen and he has rights like any other. If he committed crimes should have been arrested. The guy was smart while economic changes were happening and might have screwed us.PF bigwigs are screwing the country as we speak. I feel the opposition of HH is not right for Zambia but so if PF in its form. The country is in difficulties as it is. PF do what you can to rectify or make things bearable. The communications director Sunday’s oratory is not relevant for now. That can be done in 2021. As long as UPND has never denounced the words of its member who said “UPND is for TTOONGAS and you Sikota are not TTOONGA, you cannot be President of UPND,” the fact will remain: UPND is a TRIBAL H-ORGANISATION. HH wants to chance and he is desperate to win that is why he keeps decorating the pig with lipstick but we know UPND is a pig or a tribal organisation. We are wiser than the little boy. We can recognise a pig no matter how much you dress it with Animo Farm Attire. 1.14 Sharon. May be you are right that UPND is a Tonga dormonated party but Iam also waiting to see if PF will ever float as its presidential candidate anyone not from the bemba clan or the eastern clan. Infact Lungu himself said it that there are people who think that PF belongs to them. The only democratic party was MMD.We know you are too quick to paint others black and make yourselves look holier than thou.But remember that it is only God who has the final say and not you! HH is wiser than every Zambian. The supreme of a tribal cult can not be advised by anyone. If I were Sunday Chanda who is equally predictable the next sentence he is going to say I would not waste time with well known arrogant people filled with bitterness and pride. But I will forgive Sunday because is his to talk. Wiser than every Zambian? Let us see that wisdom take him to State House. Don’t be a clown. How exactly did you measure his wisdom? Was it wise for him to support a professional slay queen in Chilanga? This is what makes African politics challenging. Some people think leaders are small gods. I have news for you, they are not. Most are corrupt thieves that do not care about you. HH is wiser than Larry Mweetwa and BoSpakata. Mr Chanda I also remember the time when the late president Michael sata was on the neck of Mr mwanawasa with insults and bad names but later due to circumstance beyond his control they were found shaking hands…so keep in mind that this are politics and they can be played in any way you feel like…so get your cheap article off here..
You always have to take what politicians say with a pinch of salt. Sunday Chanda took it literally. These are the people behind Lungu. No wonder they do not function at all. At least there was that reconciliation, but with HH, there’s no remorse nor compunction. @Kabanshi, Sunday Chanda and Davies Mwila have employed by PF and been given shovels to bury HH politically. Sunday does it the open while Davies is at the grassroots. It is these tactics that the opposition can not seem to see and they have lost the previous numerous elections. HH is treated like Ha-King by his supporters. All of us know he is a nonentity! Maybe because of stolen money! If it had not been, he would be sweeping Cairo Road. Childish. But HH attended Levy’s Inauguration. In Africa, we attend funerals of people we have previously disagreed with. Same applies to Inaugurations, weddings, birthdays…. We are all Zambians, one big family. Wasn’t HH an opposition president vying for Levy’s seat? This !d!ot Sunday Chanda wanted Levy to say beautiful things about his competition? How dull is this boy mwebantu? This is shocking!! It’s one Zambia one nation every Zambian has right to be a Zambian president of this country, one love one heart ? one pipo different tribes and the world ???? at large different colours one pipo lates not hate one another. What Sunday Chanda is driving at is that HH was a wrong person to talk about Levy’s legacy because of his past encounters with late president. A different politician who was closely connected with Levy should have been assigned that role. I equally got waked up when I saw who the guest on the program was, because HH and Levy were not buddies and never said anything good about each other. My friend every Zambian is within his or her right to speak of the president weather or not they’re buddies.. it’s simple well see what any leader is about without personally friendly with them.. Sunday Chanda is coward so is the rest of the pf thugs, their fear is very vividly seen by anyone with a brain.. to protect the stealing and corruption they’re committing were playing this hate broken record of HH and anyone who has potential to valuate their rubbish.. petty haters.. Very biased. HH VS LEVY was not as bad as SATA VS LEVY. Yes Hakainde Hichilema is very dull. His followers have now seen that it’s time for new leadership. Hakainde danced after the late His Excellency Michael Chilufya Sata died. He celebrated when Levy Patrick Mwanawasa died. These are just politics naimwe..did you see him dance when those you have mentioned died? How long did Sata abuse Levy but when the grim reaper came knocking was it not Levy who moved govt machinery to save the old man? osankala namitima zokuda..there is more to life. You are very right, I and many Zambians do recall that from Masha Chilemena, what a shame! In short, UPND has everyone marked as an enemy and they are ready to replace all those who truly work hard as long as their names are not from Southern Province. But thank God, the next President after President Lungu in 2026 is certainly not from UPND. A very brilliant and well written article. If a person can cheat to acquire wealth and political mileage, what more if he is given the mandate to rule this peaceful nation? Well said , and it gets eorse for zamboa ,what if one is a convicted fraudster and is given control of the countries financiers like lungu ? Well said , and it gets worse for zambia ,what if one is a convicted fraudster and is given control of the countries financiers like lungu ? This is a very unfortunate piece, even from the likes of Sunday Chanda. It adds nothing to PF and takes nothing from HH. It just brings a bitter taste of hatred in our politics and goes a bit too personal by pulling in the late Mwanawasa to twist and drive an unnecessary point. Quiet offensive and childish. I can only respect what he has said if he has the audacity to do the same about Dora Siliti and Sata relationship. When it suits them there are are no sworn enemies in politics how disgusting Zambia has become. We are boycotting reading your articles logic eludes you. HH in your eyes is a devil because he makes constant reminders of you and your bosses thieving, as you loot your stomachs are grambling ,no peace baba.Stolen money is difficult to eat in silence. Did Sunday Chanda write the quotes from the late Mwanawasa? I always test my tribal alliance. I was one of the first 100 members of UPND under the great Mazoka. From this article it shows that Mwanawasa had faith in HH. Sunday is shooting himself in the foot. Can someone tell us the work of this so-called PF media director? Most comments lack discernment and basic principles of leadership. HH fails the simple character test all the time. A good leader does what he says. Mawanawasa clearly observed that HH said one thing to him and went to do another.Thats a clear red flag.Thats deception no matter what these blind UPND chaps tell us.He clearly misled Levy. By the way,Levy later made those controversial remarks likening UPND chaps to butts. So says one who worships a fraud convict lungu…who btw does not deny that he currently is a corrupt theif…. Oh look, the PF village ***** is talking again. Not you nor HH have the right to talk about Mwanawasa. He was a man way different to you Sunday. He didn’t steal nearly as much. The country functioned under his rule. High level corruption didn’t exist. The Chinese didn’t own us. But you and your posse have sold this country and its 16mil people into slavery. You are the demon. The evil. The problem. Don’t blame others. Talk about how you’ll fix yourself. That was of hh , God only knows what he thought of lungu….. If HH cheated and acquired his wealth dubiously,why did Mwanawasa leave him out when he vigorously pursued FTJ,his ministers,permanent secretaries and Generals for corruption. The whole thing does not make sense. Anyway its Sunday Chanda who authored the article…just wipe it, throw it down the toilet and flash. Deception is not a crime. Its just immoral thats why u5 survived arrest. U5 ,used to set price for Zambia airways assets cheaply and them buy . Good point but what you don’t is what motivated Mwanawasa to arrest the person who made him president and why he allowed a key witness to flee the country. Why hasn’t the money that they claim Chiluba stuffed in foreign banks forgotten about. There are many unanswered questions which I don’t think you know about. That said is history but the question that still stands is, Has HH changed for the better or is he still the HH we knew many years back? There are indicators that we can look at and consider to help us answer that question. 1. Has this man EVER praised any seating Government for any task well executed?2. Has he ever accepted criticism and come out clear on the subject matter.3. Has he ever conceded defeat on any competition.4 Has he ever agreed to be tested by holding internal democratic leadership elections?………..
It’s state house at all costs. …but since I don’t have any respect for the writer I won’t comment much. By Laura Miti on Zambianwatchdog : What is the Problem at the Concourt? What exactly is the reason behind the Constitutional Court’s long delay in hearing the Lusaka Central and Munali election petitions? Is the hold-up procedural, financial, legal, work overload?? Isn’t this the kind of ill the constitution was trying to remedy when it introduced a time limit for the petitions in the presidential election? A situation in which petitions drag on forever and then are disposed of when a term of office has essentially been served or denied. ‘WHEN I DECIDE TO JOIN POLITICS, I WILL COME AND JOIN YOU IN MMD BECAUSE I AM QUITE HAPPY WITH THE WAY YOU ARE LEADING THIS NATION.” HE SAID THIS OVER LUNCH AT NKWAZI HOUSE….. I was there. I like HH, but I feel pity for his supporters in my area who seriously believe that when HH becomes President there shall be no death, no sicknesses and no poverty. To them, he does no lie. “When HH becomes president, Petrol will be selling at K1, Mealie Meal at 2 ngwe, and there will be no one who will be sick in Zambia or die and all Animo Farms will be free of dung,” Larry Mweetwa. TO ALL ZAMBIANS: Hatred is a sin. A country so called Christian Nation but full of hypocrites especially the writer of above article who is a PF member. You need to repent my brother because you are wasting your time instead of developing this country and developing your family. Read Matthews 7 v 1 – 5. Ba Chanda GOD loves you very much. Mr. Sunday Chanda, good article! It makes sense to me! The guy wanted a post in Mwanawasa’s government just like Nevers wanted from Lungu. But when things changed they all became enemies of those they had wanted to lift them up! Waste! This article should be read in a PF meeting, makes good reading in such a forum. @Ayatollah you made my day. I had a very gloomy day up until like read your comment. Creative mwe one needs such especially with these daily challenges we face these days. LPM is greatest president that Zambia has ever had. You can not compare LPM with Sata. LPM was a professional man with heart for the people and Sata was a mere arrogant career politician.